Uneasily I approach the top stairs of the subway's Q platform at Union Square. Glancing down, I see it's packed right to the edge, impenetrable, five deep, New York evening rush hour. I make my way down the steps, carefully meandering through the throng. I hold the paper bag close to my chest and create a buffer with uplifted shoulders and slightly turned out elbows. The content of my sack is delicate; it holds the patient. Last week it was a common yellowthroat, the week before a woodcock (one of three found injured in the city that day), today it is a shivering pigeon. Huddled on a ledge over a real estate office window, with temperatures in the 20s, it was doubtful he would have made it through the night–the NYC Audubon injured bird report emailed earlier said he had been there since 9 a.m. When I arrived, he seemed a very unhappy bird. I climbed an adjacent stairs so I could reach him, then quickly grabbed him and placed him into the bag. Now we wait together for the next uptown train. The Q train arrives, so crowded that most people will wait for the next. But time is of the essence; and so with gentle determination, I wedge my way through and find a safe spot against the end door. The train lurches forward. I peek into the bag. Inside, my rescued bird is safe, shifting around and trying to flap his wings. At 87th street, I run up the stairs, carefully avoiding other pedestrians. Turning onto Columbus, I enter the Wild Bird Fund, its large window displays filled with rehabilitated birds and turtles. I fill out the intake form detailing time found, location, and symptoms - in this case, lethargy and a twisting head, probably from lead poisoning. Within three minutes, I am led into the exam room, where Lynn, the wildlife rehabilitator, gently examines the bird. His weight, at 229 grams, is about 50 grams short of ideal. We comb through the feathers, check the bones in his wings for breaks and turn him over to examine the little dinosaur-like feet; this luckless survivor has been limping around on a single toe. Normally, he should have eight nice pink ones. The loss was most likely caused by string and thread that wrapped itself around the toes, choking off the blood supply. The pigeon patient is given water and offered food. The lead test comes back positive, and he is placed in a cage to begin chelation therapy to flush the lead from his system: five days of DMSA, two days of rest, repeated for five weeks. This street bird is obviously a fighter - although underweight, lead poisoned and lacking digits, he will probably survive. If his recovery is complete, he will be returned to the neighborhood where he was rescued to rejoin the flock. 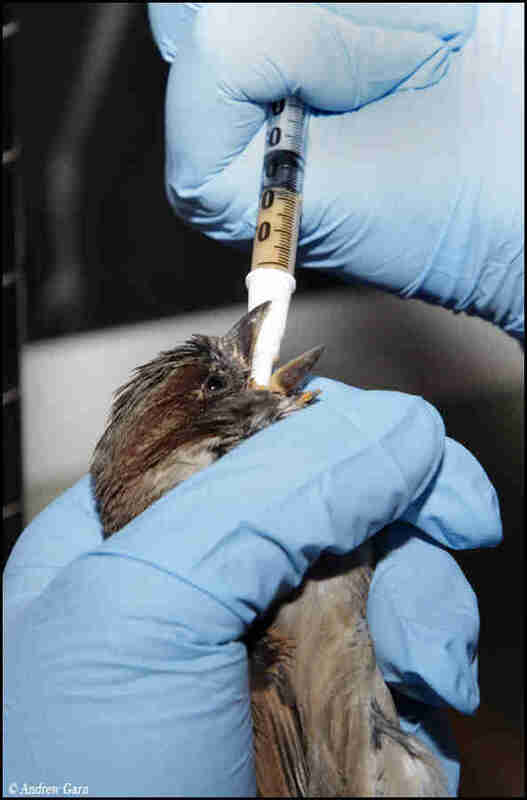 The goal of all wild animal rehabilitation is to heal injured birds for a return to the wild. If the creature has a chronic injury which may prevent it from finding food or protecting itself from predators, other options include placement in a wildlife sanctuary, or even home adoption for non-protected species (pigeons, starlings, and sparrows). If the injuries are too severe, the most humane choice would be euthanasia. If most people on that subway car knew what was in my paper bag, they would think it absurd. Why bother saving such a lowly, broken bird? I asked myself that question many times. For me, the answer was found by spending time around injured birds, whether a hawk, owl, parrot, pheasant, sparrow, duck or crow. There is obvious beauty in the feathers and wings, but beyond that is the amazing functionality: the aerodynamics, the lightweight design of muscles and hollow bones. You quickly realize birds are an incredible creation of nature and evolution. In the world of bird rescuers and rehabbers, there are always pigeons in the mix. When you walk along the cages of recuperating pigeons, you begin to see their remarkable diversity and beauty. But unlike most other birds, pigeons like to be held and touched. They become calm when a human holds them gently. They express gratitude. Before I leave my bird, I visit the other patients. 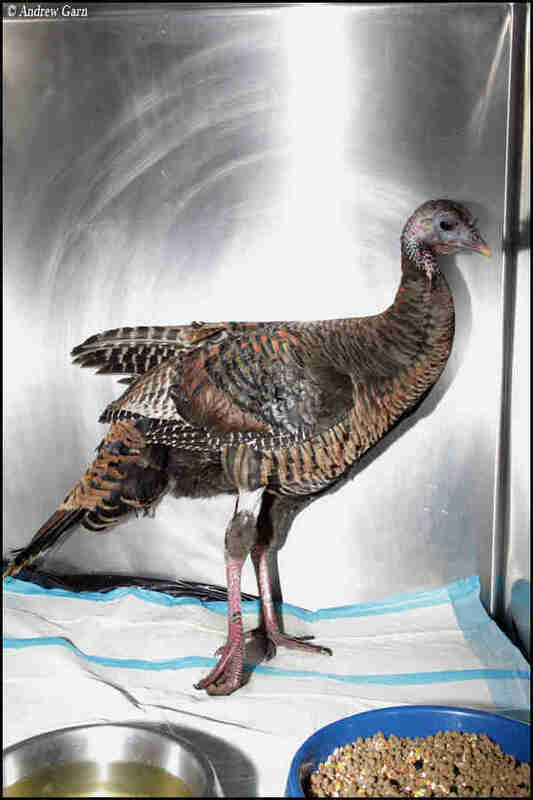 Tom the wild turkey will have surgery next week for his dislocated hip. 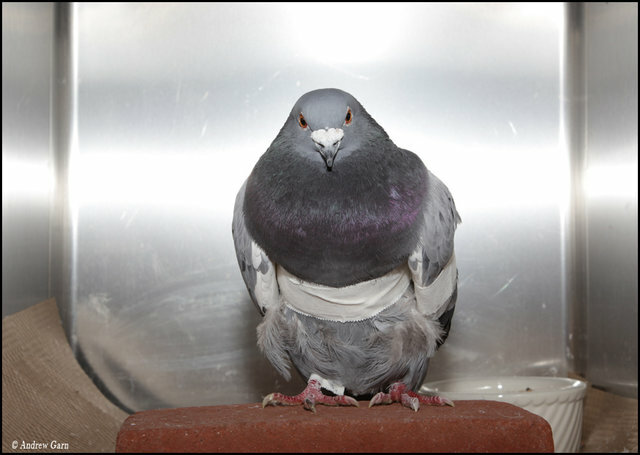 Shannon the pigeon sits languidly in her cage, grey wings taped flush to her sides; she will endure a month of healing and then hopefully will fly in the wild again. Varon twists and rotates in his cage, tilting his head constantly as if impersonating Stevie Wonder; in fact he is blind and uses the head tilting as a form of echolocation. His new adopter's name is on the cage door. By next week he will begin a quiet life in a Manhattan apartment. 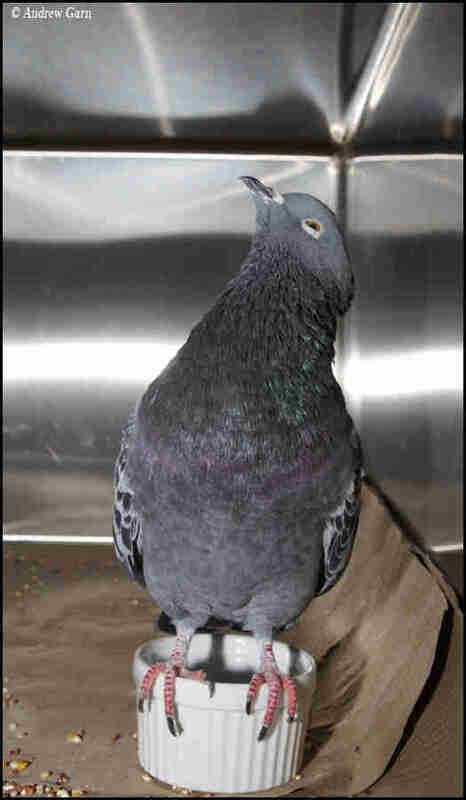 A feral pigeon (as with cats and dogs left to their own devices) will generally live only two years on the street. Kept indoors as a pet, fed regular meals, they can live to 20. The sidewalks of New York can be a harsh place to eke out a living. Text and photos by Andrew Garn. Andrew "Avian" Garn is a NYC-based editorial and art photographer who is currently at work on a book of photographs of New York Pigeons to be published Spring 2016. He is a recent Fulbright scholar for his work documenting Stalin-era industrial architecture in Western Siberia. He volunteers as a bird transporter for NYC Audubon and lives with his bird dog, Platypus. Andrew frequently photographs patients at the Wild Bird Fund.